This name uises Spaingie namin customs; the first or paternal faimily name is Cienfuegos an the seicont or maternal faimily name is Gorriarán. 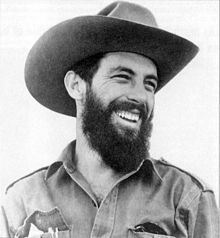 Camilo Cienfuegos Gorriarán (Spaingie: [kaˈmilo sjenˈfweɣos ɡorjaˈɾan]; Februar 6, 1932 – October 28, 1959) was a Cuban revolutionary born in Lawton, Havana. This page wis last eeditit on 21 Juin 2017, at 03:27.